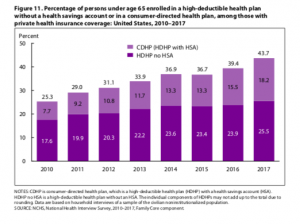 A report issued Monday by Milliman indicated that the cost of health care for a typical American family covered by the average employer-sponsored preferred provider organization (PPO) plan in 2018 is $28,166, as per the Milliman Medical Index (MMI). The key takeaway from the report is that employers are paying more; but employees are paying a lot more. The health care expenditures are funded by employer contributions to health plans and by employees through their payroll deductions and out-of-pocket expenses incurred when care is received, according to the report. The report continues that they are seeing over the long-term, and that employees are paying a higher percentage of the total, with employee expenses increasing 5.9%, and employer expenses increasing 3.5% in 2018. 1. Employer subsidy. Employers that sponsor health plans subsidize the cost of healthcare for their employees by allocating compensation dollars to pay a large share of the cost. 2. Employee contribution. Employees who choose to participate in the employer’s health benefit plan typically also pay a substantial portion of costs, usually through payroll deduction. 3. Employee out-of-pocket cost at time of service. When employees receive care, they also often pay for a portion of these services via health plan deductibles and/or point-of-service copays. Looking at this another way, employees are paying a total of 44% as either a contribution or out-of-pocket, which adds up to $12,378, compared to the employers’ 56% and $15,788, respectively. As health care gets more expensive, it will naturally lead to higher costs for employers, but also higher costs for employees. And as has been happening more commonly, employers are shifting more of the costs onto the employees. With stagnant wages, as reported daily in the news, this is going to be a problem for those families caught in the squeeze between rising costs for medical care and stagnant wages. This entry was posted in Affordable Care Act, Employees, Employer Costs, Employers, Health Care, Health Care Costs, Health Plans, MEDICAL COSTS, medical expenses, Single Payer and tagged Costs, employee costs, Employer Costs, Health Care Costs, Immigrants, Medical Costs, Milliman Medical Index, MMI, Single Payer on May 24, 2018 by Transforming Workers' Comp.